I started on my CAL blanket yesterday afternoon. I made one ‘solid’ granny in 2 colours – Teal and Fern. But I didn’t like the effect at all, so I frogged immediately. My mistake was lack of colour planning! I had already decided that Teal, Fern, Mint and Aqua would be my ‘background’ colours and that one should feature in each motif – but I now know that 2 didn’t work. A quick re-think and I decided to use all 4 of Daffodil, Melon, Zing and Rose, followed by Fern. So Tip number 1 – do some good colour planning! Progress was good – I have completed my first ‘solid’ granny and done 4 rounds of the other 7. 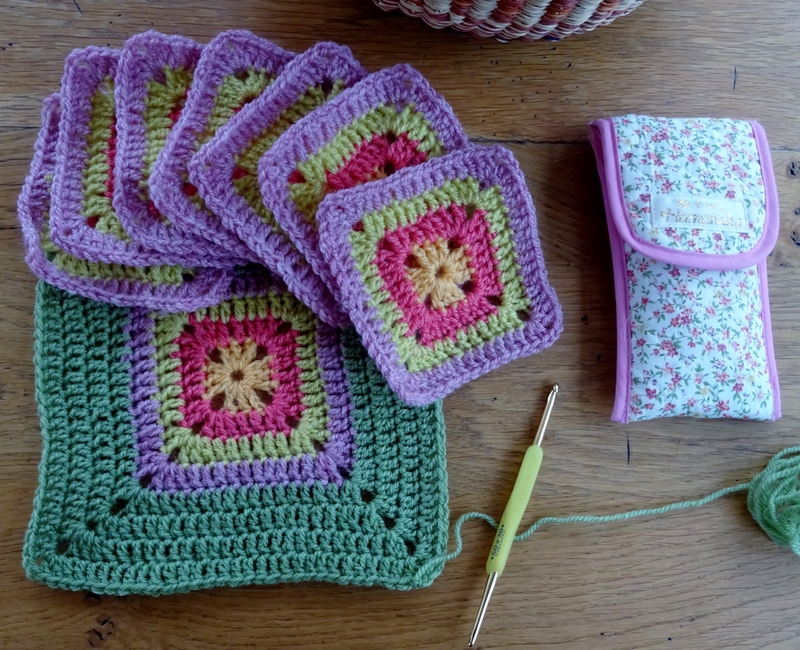 The last 4 rounds are in Fern and finishing them will be a good project for knitgroup (Tip number 2 – never take anything complicated to knitgroup, there is too much natter, laughter and other distractions such as coffee and cake!). I have been good and sewn my ends as I go, making the finishing much more straightforward. Tip number 3 – sew your ends as you go. When doing my sample blanket I used different yarn and I used my favourite Clover Amour crochet hook. I have a LOT of crochet hooks but by far my best ones are Clover Amour and Hamanaka Raku Raku, they are the ones that fit best in my hand – size, weight and touch are perfect for me. If you look at the photo you will see I’m using the Hamanaka Raku Raku hooks for the CAL blanket, and my yarn is different. Interestingly, the size of these squares is coming out larger – about 21cm square, which I think is a combination of different yarn and different hook. The amount of yarn seems about the same, so I’m not at all bothered by this as I know I have plenty of yarn. But I will keep my scales handy and keep a check on my yarn as I work through the CAL, just to keep track of how much yarn I’ve used and to ensure I have sufficient left for the rest. Tip number 5 – check your tension after the first square and work out how much yarn you’ve used, change hook size if necessary and keep a notebook handy to record yarn used. That’s all on progress so far. Incidentally, the Hamanaka Raku Raku crochet hooks are lovely and would be a fabulous addition to your Christmas present list! They are available as a set from Janie Crow, who also stock Clover Amour. Are you joining in the CAL? Of course you can! You can use any yarn provided you use a suitable hook size, but I recommend the same type of yarn throughout (for example, if using DK make sure it’s the same meterage per weight/ball even if you mix some brands).